Joy Perrin has served memory impaired client facilities since 1993!!! Including all the major 'Alzheimers and dementia' facilities in the NYC metro area from 93-03, and major facilities in Northern California, since 2003. I am an EXPERT Therapeutic Musician for the Memory Impaired, the most experienced practitioner, in NorCal. (I know WHICH ones they respond to and participate in) provide truly MEANINGFUL MUSICAL STIMULATION and participation for dementia, memory-impaired, and Alzheimers clients. CLICK HERE to see me a photo essay of some of my work. and to decrease problem behaviors.  Music tasks have been used to assess cognitive ability in people with Alzheimers Disease. 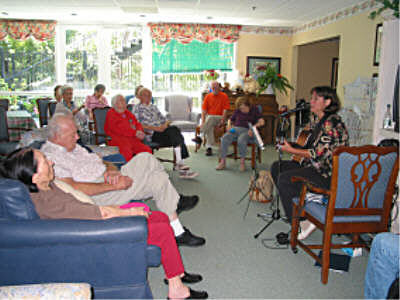  Individuals in the late stages of dementia respond to and interact with music. 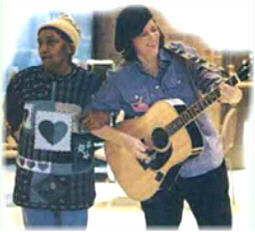 This photo taken from the 1999 brochure of Jewish Home and Hospitals, NYC, advertising their Adult Day programs. I played regular programs for Adult Day, and Memory clients at JHH at several locations, including The Bronx and Manhattan locations. I did a regular weekly programs there for years.Now known as 'The New Jewish Home' Their locations serve clients of all races, religions and creeds. A well-known Marin County Memory Care facility.